Founded in 2014 Gushue Moving Arts (GMA) supports the artistic endeavors of Charles and Rebecca Gushue. 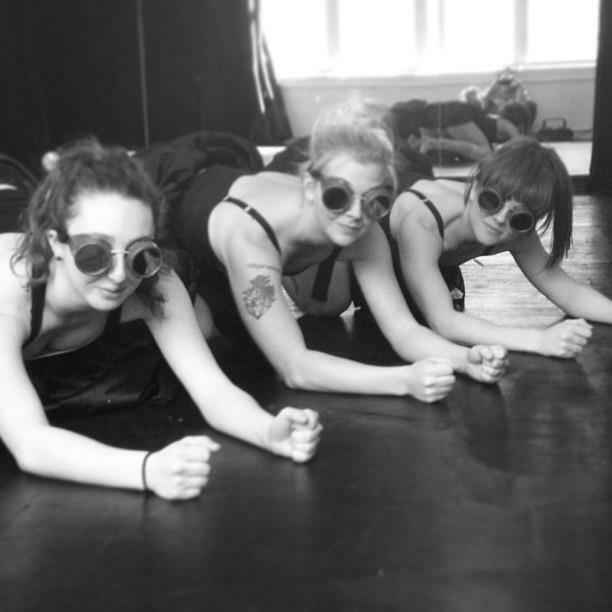 GMA works with dance/movement for stage and film, as well as in interactive events and parties. Kristi may not have one town to claim as “native”, but she’s happily found a home in Bushwick, Brooklyn; with two fellow graduates of The College at Brockport, where she received a BFA in Dance and a minor in Studio Art. She is grateful for her unparalleled creative growth with Rebecca Sproul, now Gushue Moving Arts, since 2007. After a choreographic project with Janis Brenner in 2010, Kristi Ann was introduced to dynamic duo that is Kyla & Aaron of BARKIN/SELISSEN PROJECT. She began dancing with the company in 2012, and soon after accepted the position of Management Assistant; marking full-time commitment to this inspiring and challenging company. Since her leap of faith into the buzzing center that is NYC, she has had the pleasure of working with a variety of ambitious and talented choreographers such as Spark(edit) Arts and If/Then Dance in uniquely investigative, interdisciplinary dance arts projects including music videos, dance films, art gallery submersions, iPod experiments, and more. Kristi Ann is also a NASM CPT and Fitness Nutrition Specialist, and was featured in Men’s Fitness 2012 as one of the “7 best Female Trainer’s.” She identifies wholeheartedly with her deeply rooted love of sequins, classic jazz routines, and the 5,6,7,8 discipline that cultivated the foundation of her dance career. An Ossining New York native, now resides with two of her dancing friends in a charming apartment tucked away in the heart of Brooklyn. She graduated from the College at Brockport in 2011 with a BA in dance, a Minor in Psychology, and as a dancing muse for Rebecca Sproul with what is now Gushue Moving Arts. Since relocating to NYC, she has kept busy performing around the NY area and along the East Coast with various prestigious artists: In-Sight Dance Company, Naganuma 2, Vanessa Van Wormer, a music video with Nikki Jonet, to name a few. Current work with mishiDance as well as guest appearances for the Westchester Ballet Company keep her grounded in the ballet upbringing that continually influences her movement. Her recent collaboration with a multi-city dance collective; Remote Dance Project, has also inspired her to begin creating her own work. When she isn’t dancing for one of these choreographers, Angela shares her love of dance with the younger generation at Logrea Dance Academy, as well as teaching Zumba in the NYC area. Sarah hails from New Hampshire, but after three years of city living she is calling Brooklyn home. While obtaining her BFA at the College at Brockport, Sarah originated roles in guest commission works by Dianne McIntyre and Monica Bill Barnes. It was in her freshman year that she began dancing with Rebecca Sproul; and continues to create, perform, and tour with the company, now established as Gushue Moving Arts. Since graduating in 2011 Sarah has appeared in a dance-music video by Nikki Jonet, and performed at various venues/festivals with Gushue Moving Arts and Zehnder Dance, including: Chen Dance Center, Jacob’s Pillow Inside/Out, John Ryan White Wave Theater, Triskelion Arts Split Bill Series, Midwest RAD Festival, and more. She’s currently working with a multi-city dance collaborative, Remote Dance Project, and is beginning to venture into creating her own work. Sarah is excited to continue crafting her artistry with Gushue Moving Arts.